There’s nothing quite like purchasing new technology, and between the iPhone 6 and 6 Plus launch and the holidays right around the corner, you’ve probably got your eye on a few splurge-worthy new devices. But with all your shiny new devices, what do you do with your old stuff, which suddenly looks like a hunk of junk. Only it’s not junk. It’s what is often referred to as “e-waste,” which contains carcinogenic chemicals that, if buried in a landfill, releases mercury and lead into the air. 1. Go back to where you bought it. Most of the big tech retail stores, including Best Buy and Staples, offer in-store and event recycling options. Some manufacturers like Samsung and LG run mail-back recycling programs. Typically, these programs will take your unused technology and dispose of it safely, free of charge. Most wireless carriers have trade-in programs that allow you to put the value of your old phone towards the cost of a new one. Ask your wireless provider for program-specific details. If you’re not in the market for a new phone, uSell buys old cell phones, working or damaged. And don’t forget Amazon, which has an electronics trade-in program where you can trade in old stuff for a gift card. Many nonprofits run their own tech refurbishing programs. Before shoving that old cell phone into a drawer, see if it’s good enough for Cell Phones for Soldiers, which accepts gently used mobile phones and refurbishes them for our fighting men and women overseas. Less picky is the National Coalition Against Domestic Violence , which partners with Cellular Recycler to take most cell phones, laptops, and video game systems off your hands. If it’s batteries you’re stuck with, try Call2Recycle, the international non-profit that recycles batteries and cellphones, diverting them from the e-waste stream. 4. When in doubt, ask the Environmental Protection Agency. 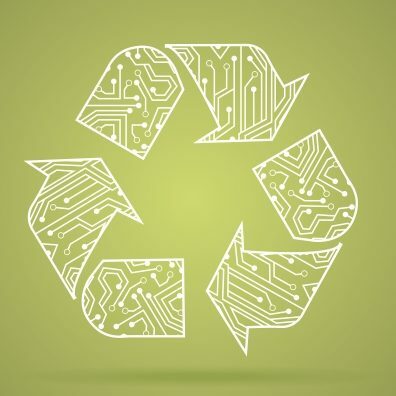 The EPA has an “Electronics Donation and Recycling” page on its web site, with a search engine for how and where to safely dispose of your used laptop, TV or cellphone and additional resources about the importance of responsibly disposing of old technology. 5. Whatever you do, wipe your hard drive. Before recycling your stuff, make sure you erase the hard drive completely. This will protect your identity and destroy any confidential documents or files on your device. Check your manufacturer’s manual for a step by step guide specific to your device, or check online. Just be sure that you’re undertaking a secure wipe versus just erasing saved data, which enables prying eyes to access your hard drive’s contents through file recovery software.